The fire department is a service you hope you will never need to use, but the one you are most thankful for when an emergency occurs and life as you know it is going up in flames. It is crucial that we all do our best to reduce fire risks in our homes and work environments. 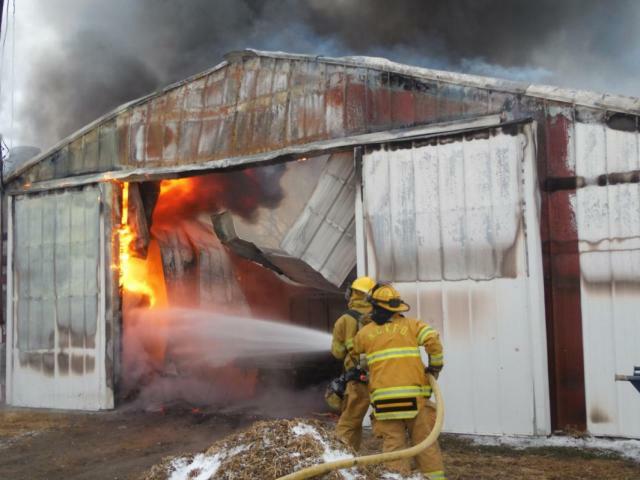 Barn fires are all too common and most are preventable. Common causes of barn fires include electric appliances, heaters and heat lamps, fans, exposed wires, dirty outlets, smoking, wet hay, and machinery. Few barns are appropriately equipped with fire extinguishers, sprinkler systems, or smoke alarms. In addition, many barns are inadequately insured for their contents. In order to protect the valuable assets stored in barns including livestock and also the people who work in them, fire prevention needs to be a high priority. Make it a point to scout for hazardous conditions around the barn. Inform everyone who works in your barn of what area are concerns for fire development, what to do in the case of a fire, and to always keep exit pathways clear. Store flammable liquids, hay, bedding, and fuel away from animals and machinery. Keep brush and trees trimmed back from the structure and maintain space between structures to prevent fire from easily spreading. Some tools that are easy to install and help reduce the damage in the case of a fire include: ABC fire extinguishers in reach of high risk areas, smoke detectors with amplified sirens, and/or barn cameras equipped with audio. Always have the contact information for your local fire department readily available in case of an emergency. Check with your insurance agency to verify that you have appropriate insurance for your structures and their contents, just in case. Once you think you have corrected the fire hazards in your barn, it may be a good idea to ask someone from your fire department to visit your farm and do a walk through of your barn. A second set of trained eyes may be the difference between life and death in the event of a barn fire. For information about how to select fire extinguishers for your farm, consult OSU Extension Fact Sheet AEX-790.25: Fire Extinguishers, available online at https://ohioline.osu.edu/factsheet/aex-79025.